Refer to DTC P2120 (See page ). This DTC relates to the accelerator pedal sensor assembly. 2. 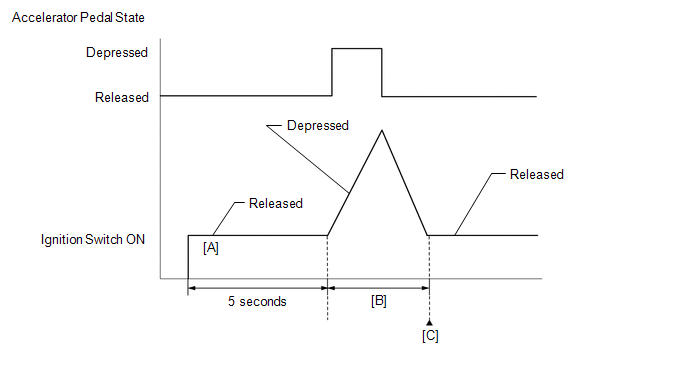 Difference between VPA and VPA2 is greater than or equal to the specified value. The accelerator pedal position sensor is mounted on the accelerator pedal bracket. The accelerator pedal position sensor has 2 sensor elements and 2 signal outputs: VPA and VPA2. VPA is used to detect the actual accelerator pedal angle (used for engine control) and VPA2 is used to detect malfunctions in VPA. When the difference between the output voltages of VPA and VPA2 deviates from the standard, the ECM determines that the accelerator pedal position sensor is malfunctioning. The ECM turns on the MIL and stores the DTC. Wait for 5 seconds after turning the ignition switch to ON. 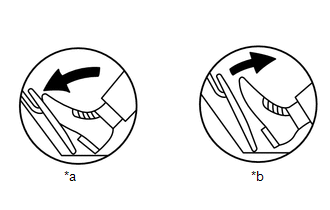 Operate the accelerator pedal in accordance with the following procedure [B]. Enter the following menus: Powertrain / Engine / Data List / Gas Throttle / Accel Sens. No. 1 Volt %, and Accel Sens. No. 2 Volt %. Slowly depress the accelerator pedal until Accel Sens. No. 1 Volt % is approximately 30% and Accel Sens. No. 2 Volt % is approximately 46%, then slowly release the accelerator pedal. The accelerator pedal sensor assembly has 2 (main and sub) sensor circuits. If a malfunction occurs in either of the sensor circuits, the ECM limits the engine output. If both circuits malfunction, the ECM regards of the accelerator pedal angle as being fully closed. In this case, the throttle valve remains closed as if the engine is idling. If a pass condition is detected and then the ignition switch is turned off, the fail-safe operation stops and the system returns to normal. This DTC relates to the accelerator pedal position sensor. If any DTCs other than P2121 are output, troubleshoot those DTCs first.